Today, Phil Carret’s investing approach is still the centerpiece of our investment philosophy - focus on companies with strong business fundamentals, manageable debt, solid cash flow, consistent earnings growth, and dedicated management teams. 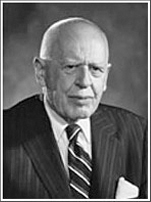 Carret Asset Management was founded in 1963 by Philip L. Carret, a Wall Street icon and investment legend who pioneered the concept of value investing, introducing it four years before the publication of Security Analysis by Benjamin Graham and David Dodd. After graduating from Harvard College in 1917, Carret attended Harvard Business School. He first introduced value investing in a series of Barron’s articles in 1927. He further described the concept in his 1930 book, The Art of Speculation. Carret put his ideas into action in 1928, when he created one of the world’s first mutual funds, the Pioneer Fund, which he managed with great success for more than half a century. In 1963, seeking to create a family office and provide investment services for institutional clients and high net worth families, he founded Carret Asset Management. Carret, who was an active investor until his death in 1998 at age 101, personally experienced 31 bull markets, 30 bear markets, and 20 recessions, as well as the Great Depression—and throughout the ups and downs, was widely known for focusing on a long-term investment horizon.